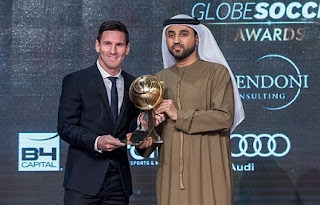 Barcelona superstar Lionel Messi won the best player of the seventh edition of the Globe Soccer Awards here on Sunday, and FC Barcelona took home the best club prize. "It is difficult to choose one moment as we were winning wherever we played," said Messi, who travelled from Argentina to attend the ceremony. "It has been a fabulous year for me and for the entire club," he added. FC Barcelona also won the best media attraction in football and its president Josep Maria Bartomeu won the best president of the year. Belgian coach Marc Wilmots was named best coach while Italy's Andrea Pirlo and England's Frank Lampard were honoured with player career award.